In preparation for an international tournament in Ireland this January, the Rocky Mountain College Debate Team competed in a tournament at Northwest College in Powell, Wyoming last weekend. The team will also compete at tournaments at USC and UCLA next weekend. The style of debate that the team takes part in is called “British Parliamentary,” appropriate- ly named and modeled after the procedures of the British Parliament. Each round consists of four teams, two that argue in favor of a motion, and two that argue against the motion. Each team is given a side, a position which determines whether they will be the rst team on their side to speak or the second, and are then given a motion. Each team is then given only fifteen minutes to prepare fully developed arguments to deliver in a seven minute speech. Debaters do not know their topic until fifteen minutes before the round starts and are given nothing but their own notes and memories to provide research and context for the case. The process, from brainstorming ideas to competitive public speaking, is very demanding for even the most experienced debaters. However, the RMC Debate team did not let such high stakes phase them. A total of eleven debaters traveled to Northwest College, five of whom were new to the team this year, to both judge and compete. It was the first competitive tournament for freshman Perri Bushlen. “It’s been fun being able to compete and being able to learn as I go without judgment,” Bushlen said. After each round of competition, judges provide constructive feedback for debaters. With the help of experienced teammates, Bushlen’s team placed fifth in overall performance. The tournament had many exciting topics and hosted several competitive teams. The wide variety of topics included motions such as, “Violence is a justified response to oppression,” “‘This House’ would put boots on the ground in Syria,” and “‘This House’ disapproves of social movements that further the acceptance of obesity.” Each round provided a learning experience for novice and experienced debat- ers alike. RMC’s rival, Carroll College, also participated in the tournament. The RMC Debate Team has a long standing relationship with the Debate Team from Carroll College. Carroll’s debate coach, Brent Northup, coached and mentored RMC’s current debate coach, Shelby Long-Hammond. One team from RMC broke into the final round, with the topic being “Pre-election polls harm the democratic process.” RMC Seniors Molly Davis and David Fejeran concluded the opposing bench, arguing that polls not only benefit and educate voters, but can make governments more aware of what values their constituents hold, which can create more effective policy. After a tough round of debating, the two clinched second place overall. The RMC Debate Team views this tournament as a way to rev up its engine for what’s to come next. The sqaud is sending three teams to the tournaments in California next weekend and three teams to a tournament at Trinity College in Dublin, Ireland in January. Participation in a tournament in Denver is planned for next Spring. 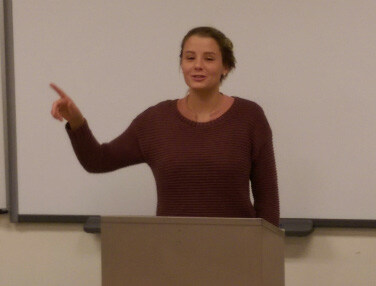 In addition to debate tournaments, the RMC Debate Team organized a faculty debate in late October, hosted multiple public debates at the local Unitarian Church, and plans to hold fundraisers this year. It is exactly this mentoring dynamic that gives Long-Hammond confidence in the squad’s future tournaments this year. More information on RMC Debate can be found at facebook.com/rmcdebate.